The first working day of the 7th plenary session of the 12th Communist Party of Vietnam Central Committee (CPVCC) took place in Hanoi on May 7. CPVCC General Secretary Nguyen Phu Trong delivered an opening remark and then President Tran Dai Quang, on behalf of the Politburo, chaired the sitting. In the morning, Politburo member, standing member of the CPVCC Secretariat and head of the CPVCC’s Inspection Commission Tran Quoc Vuong submitted the session’s working agenda to the CPVCC for approval. Politburo member Pham Minh Chinh, Secretary of the Party Central Committee and head of the Party Central Committee’s Organization Commission read a Politburo proposal on the project on building the contingent of cadres at all levels, particularly strategic level, with sufficient capacity, virtue and prestige on par with their tasks. 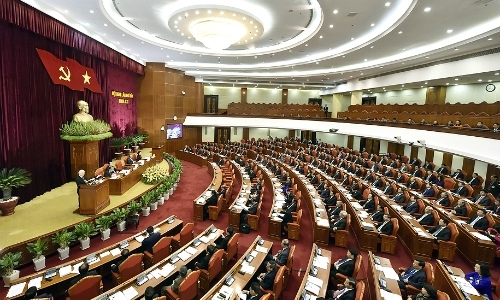 Politburo member and permanent Deputy Prime Minister Truong Hoa Binh delivered another proposal on the reform of salary policy targeting officials, public employees, civil servants, armed forces, and workers in enterprises. A plan on social insurance policy reform was presented by Politburo member and Deputy Prime Minister Vuong Dinh Hue. In the afternoon, the CPVCC worked in groups, discussing the personnel scheme.